The Southwest Tribal Native American Research Center for Health (NARCH) Program is located in Albuquerque, NM and is part of a national initiative established in partnership with the National Institutes of Health and Indian Health Service. 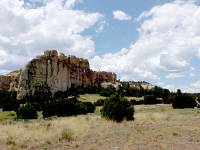 The Southwest Tribal Native American Research Centers for Health (NARCH) Program is administered by the Albuquerque Area Indian Health Board, www.aaihb.org. The Southwest Tribal NARCH Program is part of a national initiative established in partnership with the Indian Health Service and the National Institutes of Health. Through NARCH, American Indian and Alaska Native tribes or tribally-based organizations form partnerships with academic institutions to conduct intensive biomedical and behavioral research on existing and persistent AI/AN health problems. A major goal of the NARCH initiative is to increase the number and capacity of AI/AN professionals in the health field.